Villa Acajou is a lovely getaway for the guest who wants to be on the water all day, every day. You can borrow the villa’s stand up paddle boards or kayak and paddle out of the canal into the ocean, all from your backyard! There’s also several beaches near the villa, like world-renowned Grace Bay and serene Long Bay. One feature I really like about this villa is the poolside TV in the gazebo - kids and adults alike will love watching their favorite flick while floating in the solar-heated pool! Bring your whole family to Acajou for a vacation you’ll never forget. A peaceful retreat yet close to all the action! Acajou is nestled along the Leeward canals on Providenciales, the most developed and popular island in Turks and Caicos. Acajou translates to “mahogany” in French, and this wood is featured throughout the house to add luxury and warmth to this tropical getaway. A 50 ft. dock runs alongside the canal, and borders the villa’s outdoor amenities. The solar heated pool sits in the middle of the property, shaded by palm trees. An adjacent gazebo with lighting and a TV provides a cozy spot to enjoy a glass of wine (or the whole bottle) under the stars. A full bath with an outdoor shower sits to the side. Walk across the terrace to the outdoor bar and grill to mix up a drink or snack, and enjoy it on the veranda a few steps above the pool. Guests have access to two standup paddle boards and a kayak that they can paddle into the canals or the shallow ocean waters less than five minutes away. A hammock is strung up between two palm trees next to the canal, for those who want to relax under the sun. A few steps inside the veranda, the formal dining room provides seating for 8-12 people. Ceiling fans keep the room cool, and the living room is on the other side of a row of pillars. For entertainment, the flat screen TV has cable, Apple TV, and a movie server with over 800 movies. The gourmet kitchen features a large island with bar seating, modern stainless steel appliances, and a convenient location between the living and dining rooms. Acajou has four air-conditioned bedrooms spread throughout both levels in the main house, and a guest cottage with two air-conditioned bedrooms, two ensuite bathrooms, a full kitchen and sitting room. The master bedroom has an ensuite bath, king-sized bed, and exterior access. Of the remaining three bedrooms, two have king-sized beds and one has a queen-sized bed. One upstairs bedroom has an ensuite bath, and a main level bedroom has exterior access to the veranda. The guest cottage bedrooms each have a queen-sized bed and ensuite bathroom with exterior access to the terrace. Acajou villa is minutes drive from Grace Bay beach and Long Bay beach, both amazing white-sand beaches the Turks & Caicos are known for. Recreational activities at Big Blue Adventures are within a 5 minute walk, and the nearby Blue Haven Resort offers numerous outdoor activities, a spa, two restaurants, and a coffee shop. The location and amenities at Acajou are superb! 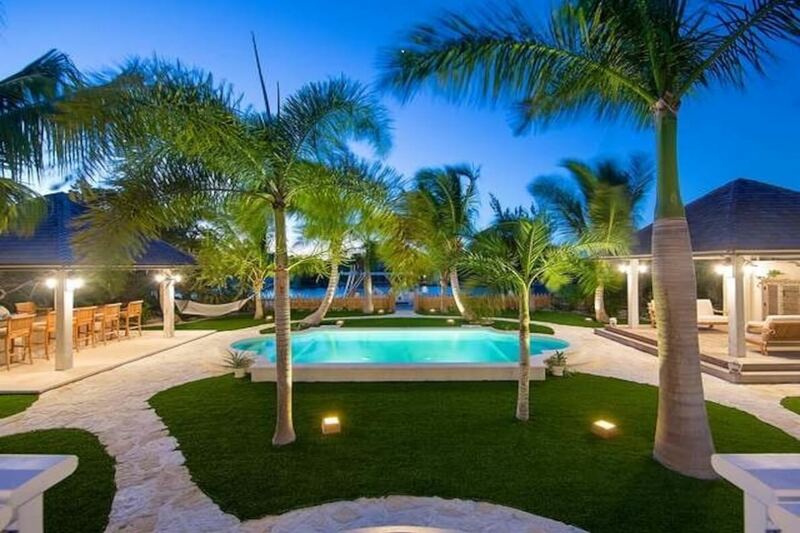 Waterfront, a 5 minute drive to Grace Bay beach. To kayak would be a bit longer but it's a beautiful paddle! About a 7 minute drive to Long Bay beach. Any AC overage is charged at market rate. Car rental, private chef, butler, server, daily maid service, grocery and beverage shopping (pre-arrival and during your stay), liquor and wine delivery, nanny service, baby equipment, spa services, yoga and personal training, photography, and private airport transfer/car service can be arranged for an additional fee.